The new year is just around the corner, some of you out there might be thinking of updating their blog domain name to other URL . There are a lot of reason why getting your own domain is encourage .You can have a read on what other blogger wrote about this topic . Personally ,why I want to change my current blog name because of the "name branding" and "URL promotion" attach to it . In this tutorial, I'm going to share how you can change your blogger domain to custom domain URL . I will use the existing blogger free hosting function and will only change the site URL. I used Go daddy as my domain registrar. There are quite a few out there registrar for you to choose. If you are planning to use Go Daddy ,please use my ref feral by quoting "WOWG33ky" .You will be getting 20% out off your purchase. Once you completed the linking between your new domain URL and Blogspot/Blogger hosting, you don't need to do anything on your previous post. It will be updated automatically. Below are what you will be doing throughout this tutorial . 2. Link the new domain URL to Google domain server . 3. Save the setting in Blogspot. 1.Purchase a domain name . You are free to choose to buy a domain name from any domain registrar .Below is quick suggestion that you can look into . 2. Link the new URL to Google server. 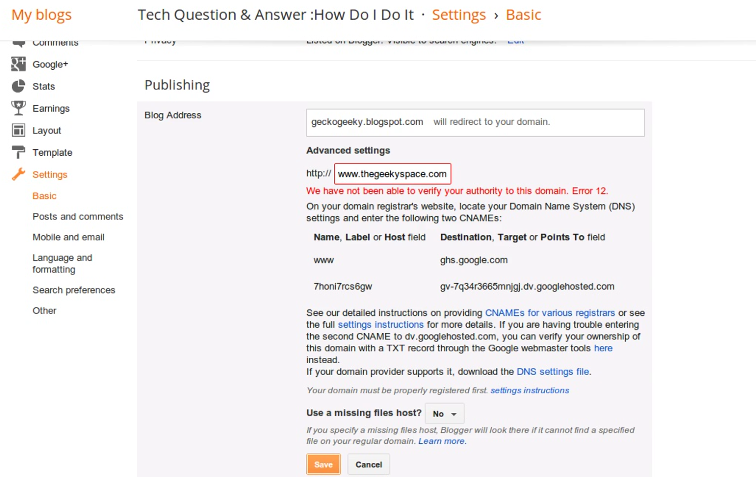 2.1 On Blogger ,go to 'Blogger>Settings>Basic ' fill in box for your new registered domain URL . Then click save . The system will give an "Error 12 " and you will be assign with CNAME details. CNAME stand for Canonical Name record which is a resource record in the DNS .It is used to specify that a domain name uses the IP address of another domain .For more information,you can read here. Pay attention to the second line in the of the CNAME. This is name and where it pointed to is unique to every user. 2.2. Login to your domain account and update the CNAME details. "edit" the DNS zone file. 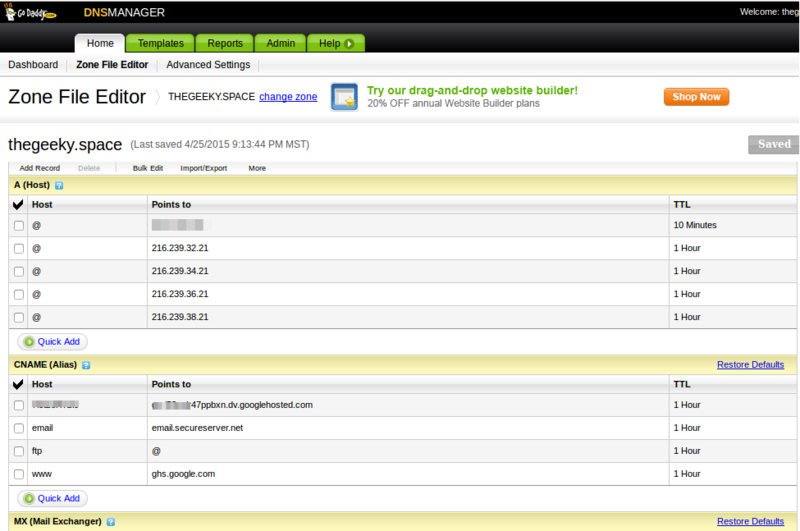 Below is snapshot from Go Daddy DNS zone. 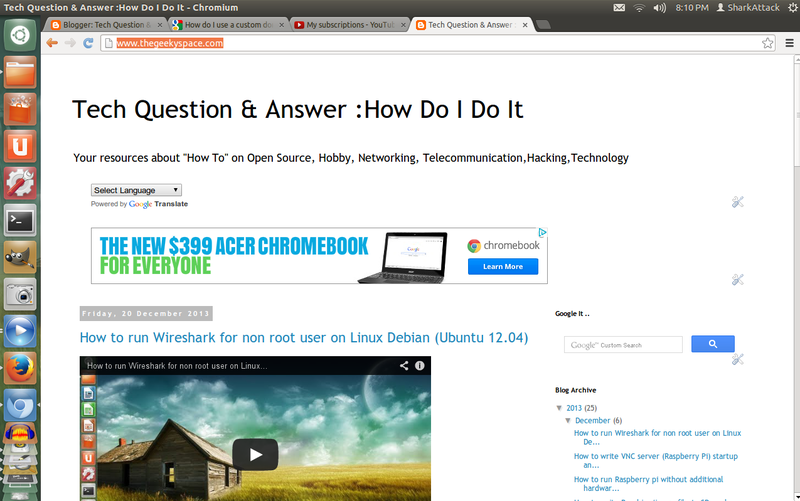 2.3 Look for CNAME table and update the information from the Blogspot. Click the "pencil" sign to edit the "www" detail. For the unique name and pointed field, click "Quick add" and add it on . Make sure both details are update in CNAME information table . 2.4(OPTIONAL) Updating the "A records" . A records is a table of IP address that will point to Google server. If you skip this step, whenever a visitor looking for your page who leave the "www" ,it will show as an error page. To point it to Google server IP, you need to add below IP . 3. Save your setting in the Blogspot . If you do everything correctly,the server will notified your new URL and "Error 12" will be remove. That's it for now. Drop some comment and have a good day! !